We want Watershed Wellness to be your home for information, inspiration and treatment as you are living your best life. From our location to the training of our practitioners to the products we offer in our herbal pharmacy and waiting room, everything has been chosen with this mission in mind. What do you think of when you hear the word – watershed? One of the pictures that comes to our minds is of a little corner of the Sandy River with black sand beaches, deep cold swimming holes, tangles of douglas fir, vine maple and a little poison oak. Maybe you think about the annual salmon return and watching the circle of life play out as the fish return to their natal homes. 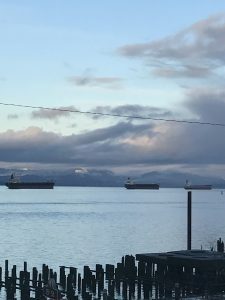 Or, obviously, in Astoria you might naturally think about all the rivers running together and out to the sea, and the complex interactions between fish, farms, ships, sea lions and plenty of winter rain. All of these things have something in common – they highlight interconnections between living things and every aspect of their environment. We approach health and wellness through this lens. What does that mean? It means that all of our practitioners take it as their responsibility to look at you and your health situation with a holistic framework in mind. Your back pain may have something to do with your stress level at work, or gut inflammation from a diet that is wrong for your body, or some other feature of your environment. Your shoulder pain on one side of your body could be related to the hip pain on the other side of your body! The interconnections are important, and powerful for healing. Watershed Wellness was founded in 2009 by us – Eric Grey, LAc and Amanda Barp, LMT. Partners in business and life, we've worked hard to build our 2-person practice into a thriving multi-modality home for healing now supporting 10 providers of excellent healthcare to inner Southeast Portland. 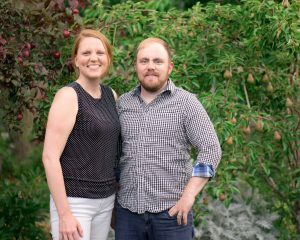 We are both small town kids, Amanda from Nebraska and Eric from Idaho, and while Portland has been good to us – helping us launch our practice and raise our daughter – in 2016 we knew it was time to get back to the deep connections and slower pace that small town life can bring. So, we nurtured our Portland clinic until it could fly on its own and in spring of 2016 started our next chapter in the town we hope will be our forever home – Astoria, Oregon. It's taken us a while to learn enough about the Astoria community to feel comfortable knowing what to offer here – but it's finally time. In January 2017 we opened our doors in the heart of Astoria with a gorgeous view of the majestic Columbia river from all spaces in the clinic. Adding more practitioners, a movement space (with yoga and qigong) and more – we've grown rapidly in our new home while still learning how to juggle managing more than one location along with everything else. We've got a lot more planned, and hope you'll stick around to see what comes. We believe that healthy, thriving people are the foundation of a strong, just and joyful society. It may sound lofty (and it is) but it's true – we are all passionate about helping every client be their best self – free of suffering and relaxed, ready to take on whatever life brings. Think of what a country full of stress-free, pain-free, chronic-disease free communities could do! That vision is with us no matter what modality we practice. We do this work primarily through the use of our rich education and experience in holistic frameworks of healing. We practice these modalities, but some of our favorite work is just educating the community about health, disease, our bodies and how to keep them thriving. We do that through our public events (like us on Facebook to be notified of upcoming opportunities), our blog and our newsletter. We also take our commitment to the natural world very seriously. We use 100% recycled versions of all our office products whenever available, are committed to sourcing only the most sustainable supplements and herbs, and are renewable energy supporters. We're also looking to partner with like minded organizations that work to educate the public about natural resource issues, our ecological responsibilities and the power of nature to be a source of healing in itself. Our clinic in Astoria is what we've dreamed of for as long as we have been thinking about a clinic! The space is dominated by a huge bank of windows that give you an absolutely stunning view of the Columbia, the mooring basin and all the fascinating shipping, fishing and Coast Guard traffic that flows in and out of the area. Birds, sea lions and the rapidly changing weather will help you feel ever more connected to this place we call home. We are located only blocks from popular restaurants such as Fort George, Blue Scorcher, The Columbian, Street 14 Cafe, Clementes and Frite and Scoop. We are walking distance to all the more popular hotels, and after your treatment you could easily visit the Sunday market, walk the Riverwalk, take a ride on the trolley or simply stroll the beautiful downtown area window shopping. We'll be talking a lot about what we love about Astoria and the surrounding area on our blog, our newsletter and our Facebook page, so keep in touch! To learn more about the area and how to get here, read through our Location page.